Discover what makes this Essex seaside town an ideal location not just for food, culture and entertainment, but also for building a business. So, what is it about Leigh-On-Sea that makes it a perfect home for a full-service, tech savvy creative marketing agency with an international client-base? And why do we all want to live here in the first place? Well, if you have pre-conceived ideas about what an Essex seaside town might be, it’s a good idea to set those to one side if you’re trying to understand Leigh-on-Sea. Leigh is something of a cultural oasis, blending the avant-garde with the traditional. It has a thriving arts and music scene and is a haven for independent shops and restaurants. 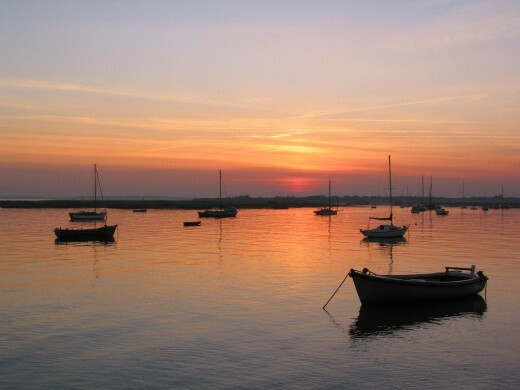 In 2016, Rightmove named Leigh-on-Sea the happiest place to live in the UK, and it offers plenty of reasons to be cheerful. Leigh’s cafes, boutiques and delicatessens help to retain an independent flavour that contributes to the town’s unique feel, as does the backdrop of the Thames Estuary, with its marine traffic sailing back and forth and the North Kent coast just visible in the distance. The old town offers the charm of cosy pubs, cobbled streets, the sound of wind in rigging and the opportunity to buy seafood fresh off the boat. The Broadway adds sophisticated shopping and dining. Award-winning ice cream parlour Poco Gelato embodies Leigh’s blend of the traditional and the trendy. Yes, you want an ice cream by the seaside, but why not make that a black sesame gelato with mango sorbet freshly made on the premises? Don’t worry – they also do vanilla. Food By John Lawson on Leigh Road is a relatively new restaurant that’s making waves in the gastronomic world. John’s story, from ex-pat Michelin Star chef in Australia to brain tumour victim to successful chef-proprietor is nothing short of inspiring. But again, Leigh does not disappoint the traditionalist – you can get a cracking tray of fish & chips from any one of Leigh’s outstanding chip shops and enjoy them on the beach. Or if café culture’s your thing, you are spoilt for choice. For music lovers, there is a thriving scene bubbling away all year long with two major festivals punctuating the summer: Leigh Folk Festival and Village Green. The Folk Festival is the UK’s biggest free folk festival attracting a crowd of 20,000, and the more contemporary Village Green welcomes nearly 40,000 and seems to attract bigger names and audiences every year. Many of Leigh’s small, independent bars and cafes host weekly open mic nights featuring music, poetry and comedy, so there’s always something going on. The art world has always fed into the world of marketing, and in Leigh we are not short of inspiration. The Francesca Maffeo gallery on Leigh Road recently hosted the debut exhibition of a collection of beautiful, candid and never seen before photographs of David Bowie taken by his backing singer and best mate from the 70s, Geoff McCormack, who lives locally. Each June, proprietors of Leigh’s shopfront businesses throw open their doors to exhibit artwork in an event called the Leigh Art Trail. For one week, Leigh’s shops and cafes are filled with paintings, photographs, sculptures, ceramics and more as visitors wander through the town sampling artwork at their own pace, free of charge. Art collective Metal has a base in Chalkwell Park from which it organises the aforementioned Village Green Festival, runs an art school, supports artists both locally and internationally, and even offers an MA in Alternative Art. The business landscape in Leigh sustains a thriving and multiplying crop of local independent firms, many of whom are expanding just like Storm. Leigh is a conducive centre for many of our service industry clients, while the profusion of trading parks to our North and West provide homes for clients with a manufacturing or distribution focus. Storm has many cherished local clients, but being an ‘out-of-town’ agency has not prevented us from attracting clients from further afield. We work with an impressive portfolio of national and international businesses – in fact our biggest client is 4750 miles away in Texas. Our location is no barrier to hiring either. There may be a more select pool to draw from, but through judicious and patient recruitment, as well as in-house development, Storm has assembled a team of top-flight specialists. One of the agency’s most important values is that we are a team of specialists, not generalists. Each team member is an expert working to their strengths. And just maybe, people who want to live and work in a place with such a high standard of living and lower living costs than London, are a tiny bit brighter! We like to think we have the talent and ambition to match our London rivals, but without the overheads. Our clients certainly seem to recognise and appreciate this. We enjoy being here both in our working lives and our home lives and when you enjoy what you do and where you do it, it shines through in the results. We love entertaining and we’ve been helping businesses here for over 20 years, so when our clients drop by to see us, we are seasoned experts at showing them a good time. If you don’t know Leigh, we recommend you come along one sunny day to check it out, and drop into Storm to see how our team can help grow your business.